England cricket team is having a great form in 2018 in their home conditions especially since they handed a whitewash 5-0 loss to Australia in the recently concluded ODI series between the 2 sides. If England side really wanted a good test of their ODI skills before the World Cup begins at home next year than there would not be a better opportunity than to take on the Number 2 ODI side of the World – India at home. England recently have got the Number 1 ranking in ODIs with both their openers in form and a consistent middle order batting lineup which have seen England losing only 4 ODI matches out of the 21 that they have played in the last 12 months and recently this very England ODI team defeated Australia at home by thrashing the Australia team 5-0 in ODIs. If we take the recently concluded T20 series between England and India which was extremely competitive and India defeated England in the 3rd ODI by chasing their highest ever total so far – 199 in away grounds with a superb century by Rohit Sharma, there is a clear indication that the batsmen from both the sides are in top form. 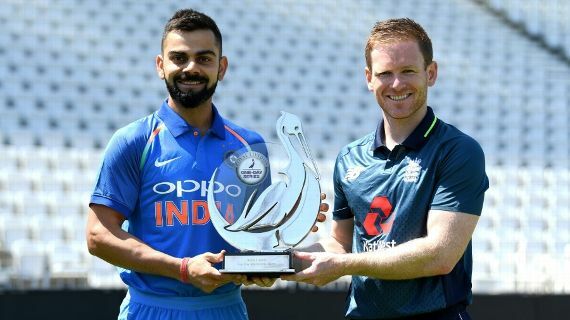 The ODI series will also be extremely competitive and neck to neck between England vs India and the key will be how and which teams plays consistently and maneuver crucial short phases in the matches that could decide the overall winner. On Flat batting tracks – Expect both England and India’s batsmen to fire on all cylinders. With Jason Roy, Jonny Bairstow and Jos Buttler who can play very aggressive to Rohit Sharma, Shikhar Dhawan, Virat Kohli and KL Rahul and not to forget MS Dhoni who can chase down any total with ease. This series will be a treat to watch for ODI batting lovers. England’s batting order depth is more stronger compared to India in their home conditions but India has the bowling advantage especially since it was India’s bowling attack which enabled them to defeat South Africa recently. England’s inability to play spin will be a crucial weakness open to India’s spinners to exploit and India have 2 very good young talented spinners in Kuldeep Yadav and Yuzvendra Chahal who have a bright start to their ODI careers and both are capable of running through a side with their variations and miserly line and length. In terms of Bowling overall – India has the advantage. as Cricket Fever team believes this ODI series is a test of England batsmen vs India’s bowlers. All the visitors who play dream11 fantasy cricket online can check the India dream 11 team and England dream11 teams above which we have selected. Cricket Fever believes that with a stronger bowling side, India will win the ODI series vs England by a 2-1 margin. If you feel that there can be a different outcome to the India vs England ODI series then feel free to log on to novibet.co.uk and place your bet and predict the winner between India and England in the ODI series. England Played Well and deserved the series….